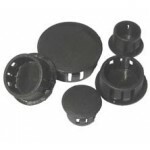 HOLE PLUGS. Buy quality Auto and Marine Electric Parts and Accessories online, Sydney. HP08Hole Plug 8mm7.8mm ⌀ black Nylon plugSuits material thickness 0.8 - 3.2mm Projects into hole ..
HP10Hole Plug 10mm9.5mm ⌀ black Nylon plug Suits material thickness 0.8 - 3.2mm Cap is 13mm ac..
HP13Hole Plug 13mm12.7mm ⌀ black Nylon plug Suits material thickness 0.8 - 3.2mm Cap is 16.9mm..
HP16Hole Plug 16mm15.9mm ⌀ black Nylon plug Suits material thickness 0.8 - 3.2mm Cap is 19.8mm..
HP19Hole Plug 19mm19.0mm ⌀ black Nylon plug Suits material thickness 0.8 - 3.2mm Cap is 22.9mm..
HP22Hole Plug 22mm22.2mm ⌀ black Nylon plug Suits material thickness 0.8 - 3.2mm Cap is 24.9mm..
HP25Hole Plug 25mm25.0mm ⌀ black Nylon plug Suits material thickness 0.8 - 3.2mm Cap is 28.3mm..
HP30Hole Plug 30mm30.0mm ⌀ black Nylon plug Suits material thickness 0.8 - 3.2mm Cap is 34.2mm..
HP38Hole Plug 38mm38.1mm ⌀ black Nylon plug Suits panel thickness 0.8 - 3.2mm Cap is 42.4mm ac..